Bachman Village 19 blends luxury and convenience in beautiful downtown Telluride. The main living level features a massive great room with huge vaulted ceilings, a large flat screen television with a sound system, ample seating and great South and East facing views from its towering windows. Need to check the ski conditions? Just look to the south! The view of the Telluride Ski Resort is right there! The wonderful gourmet kitchen is very spacious and features modern appliances. The bar stools at the kitchen island will be very convenient for the chef critics! There is a half bath on this level, as well as a south facing huge deck complete with a grill. The master suite is on the upper level of the home and has a king bed and a private bathroom. The other three guest bedrooms are on the ground level. The bedroom with two twin beds and the bedroom with two sets of twin bunks share one bath and the third bedroom on this level has a queen Murphy bed and a private bath. Access to the private outdoor hot tub is through this bedroom. Overall we loved our stay at Bachman Village #19. It's tough to beat being only a block away from the chair lift and at a stone's throw from the market and town center. The location is world class. Parking , however, was tricky. The house itself only offers parking room for 1 vehicle. We arrived from out of state with 3 separate vehicles (3 families), Overnight parking on the street is by neighborhood permit only. Only 1 such permit was provided. This made for a stressful stay having to worry constantly about being towed. Frankly, at this price point, parking arrangements for all vehicles are expected. Thank you for review of our Bachman Village 19 home. You are right, it is a great location. Winter or summer, you can't beat it. As far as parking goes, we have no control over the Town of Telluride's rules of only one guest permit per unit. Our little mountain town will always have parking issues when guests bring multiple vehicles for one property. We do our best to accommodate to these needs, as we did with your group. Wonderful location for a group ski trip. Our group of 9 adults loved staying at this property for our annual ski trip. There were plenty of beds for all, a quick walk to Lift 7, the grocery store, and plenty of room for lounging after a day on the slopes. The downtown restaurants and shops were just a short walk away. We feared parking would be problematic as several of us had to drive in from various locations but the management company was very accommodating to all our needs throughout the duration of our stay. I would absolutely stay here again. We are so glad you enjoyed your stay at the Bachman Village #19 home. It is perfect for large families, or in your case good friends! We thoroughly enjoyed hosting you. We hope to see you all again! We had an excellent time at Bachman 19 - couldn't have been a better landing pad for our group. Everything was clean and we found everything we needed, from spatulas to hair dryers. The main level is perfect for hanging out with a group. Thanks for a great stay! Thank you for the great review. Please come back and stay with us again! From the ladies at Accommodations in Telluride! This home had all the amenities you needed for a vacation rental. I was impressed with all the cookware the kitchen had. With the house full of people I did not feel once like I was living on top of anyone. Plenty of space for everyone. I would happily rent this property again. Comfortable, spacious and the location is stellar! 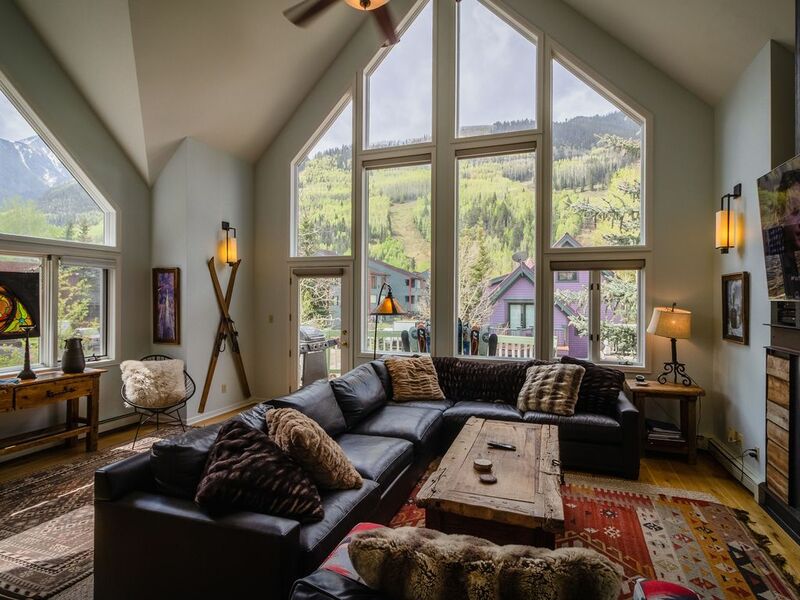 This is the perfect getaway home in Telluride. The location is so perfect, just close enough to downtown to be accessible, but far enough removed so you're not in the hustle and bustle. Plus, it's right next to one of the only grocery stores in town, Clark's Market, so that made things very easy. The big, spacious kitchen and living area is perfect for an entire family or group of friends to hang out in and socialize (the dining table is huge! ), and there are plenty of rooms and beds for everyone! The master suite upstairs is huge and super cool. The views from every window are spectacular, and it was nice to have an upper deck and a hot tub. I will say, the house needs a tiny bit of updating: the oven and stove were very hard to cook with, and some of the windows would not open or close, which we needed to have open because it was very hot in Telluride the weekend we were there, but none of these things were deal breakers for my family because we are pretty easy going. Plus, I got the feeling that if we had called the property management office, they would have righted anything. All in all, it was a lovely stay in this property and I would stay here again in a heartbeat. Thank you for your amazing review of our Bachman Village #19 home. It is one of our most popular properties and everyone seems to have great time there. It is far enough from the hustle and bustle of Main Street, but a quick five minute walk to a shuttle stop and your there in about five minutes., Thanks again and we hope to see you next summer! Thank you for your response and comments about our Bachman Village #19 home. The local cable company changed to digital, so basically every home in the town had to have new boxes. We appreciate your understanding and hope to see you again next summer!